Want to know a little more about the Water Safety Products lifeguard store? Wondering why you should choose us to provide your lifeguard equipment and uniforms? Personalized pricing: Every facility has different needs. We’re ready to fulfill them. Our online store for lifeguards will show you how ordering more means paying less with our quantity pricing. Need a quote; looking for a better price? Just give us a call at 1-800-987-7238, ext. 4. One stop lifeguard shop: Many of our customers choose Water Safety Products’ online lifeguard store because we’re a simple, one-stop shop for all your lifeguard outfitting needs. We offer a wide array of lifeguard uniforms and swimsuits, lifeguard equipment, rescue equipment, facility equipment, and lifeguard training equipment. In addition, we have safety items such as learn to swim tools and toys, lifeguard incentives, and exclusive specialty programs such as the World’s Largest Swim Lesson. We also offer maintenance solutions for retrofit and new installations such as maintenance-free plastic staircases, stair tread covers, docking, decking and more. If you can’t find what you’re looking for on our website or in our catalog, give us a call and we will help. Over 25 years of experience: Water Safety Products has been providing lifeguard uniforms and equipment for over 25 years. 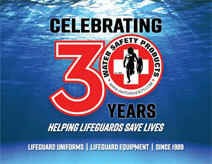 Since 1989 we have dedicated our efforts to producing premium lifeguard equipment, bathing suits, and uniforms. Our longstanding expertise in swimsuit manufacturing gives us the knowledge to help you find the solution that best fits your facility. Friendly and professional staff: We are committed to our industry and our customers. We will do our best to make the buying process as easy and efficient as possible for you. Built tough/ Made in the USA swimsuits: All our lifeguard swimsuits are made in the USA from the highest quality American fabrics. The result is a long-lasting, professional lifeguard swimsuit and an immediate turn around on your order. Quick /efficient service: No one can supply lifeguard uniforms faster than Water Safety Products! There’s no need to wait for more swimsuits to arrive. They’re already in our warehouse waiting for your order. Most orders will ship within 48 hours or faster! Please note that custom orders or orders with a large variety of items may take more time. Customizing and branding: Customizing lifeguard bathing suits is one of our specialties. All of our swimsuits are logo-free so you can add your company’s embroidered logo without a hassle. If you want your brand, you get it! Just one more: How frustrating is it when you need just one more uniform, but your supplier needs you to order a minimum quantity to give you the same price, or worse they don’t have just one more in stock? At the Water Safety Products store for lifeguards you will get your established quantity price when you need just one more. Same price, same color, same logo! Please note that custom silk-screening is exempt from this policy. Timeless consistent style: Lifeguard styles are timeless, and so are our uniforms. We buy our own fabrics and manufacture our own suits, so our colors and styles are consistent from year to year. Don’t worry about having to change your outfit for next season, or find another supplier. We stock a consistent product you can add to your inventory at any time, from one season to the next. Hassle-free returns and exchanges: We at Water Safety Products want you to be fully satisfied with your lifeguard equipment, uniforms, and supplies. We will happily accept returns and exchanges as long as the product is in new, unused condition and is returned within 30 days. Click here for more info on returns and exchanges. Samples: Want to see our quality for yourself? We would be happy to send you samples of our products. Please note that samples are billed Net 30 days, or charged to your credit card. You will get full credit for samples if you return them, unused, within 30 days. If you prefer to test the garments, the invoice must be paid within 30 days. Please note shipping charges apply. Big or small, we serve them all: We serve a variety of large and small aquatic facilities, from our specialty market - major world class theme/ waterparks - to individual lifeguards at public pools. We can meet your needs no matter what they may be. We also create swimsuits and uniforms for photographers, food staff, service colleagues, gymnasiums, and even local car wash teams. International sales: With thousands of accounts in more than 30 countries, we are the leading international lifeguard uniform supplier. We are very familiar with the international trade process and will be able to serve you as needed. You can have all of the excellent benefits of being a Water Safety customer no matter where you reside. Here are some of the countries we currently serve: China, India, Indonesia, Brazil, Cyprus, Libya, Japan, Mexico, Philippines, Germany, Thailand, Singapore, United Kingdom, Spain, United Arab Emirates, Qatar, and more! We are actively involved with initiatives and groups that help the aquatic community locally, nationally, and internationally, including local initiatives, World Waterpark Association, IAAPA, World’s Largest Swim Lesson, Note and Float,and Breast Cancer awareness.